Here's an idea for a potential future layout in the Farthing series. 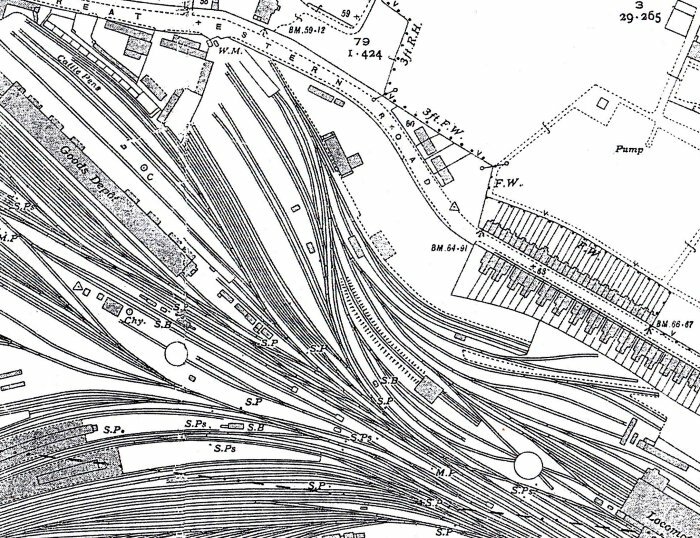 The idea is to show a small section of the yard and sidings at Farthing. 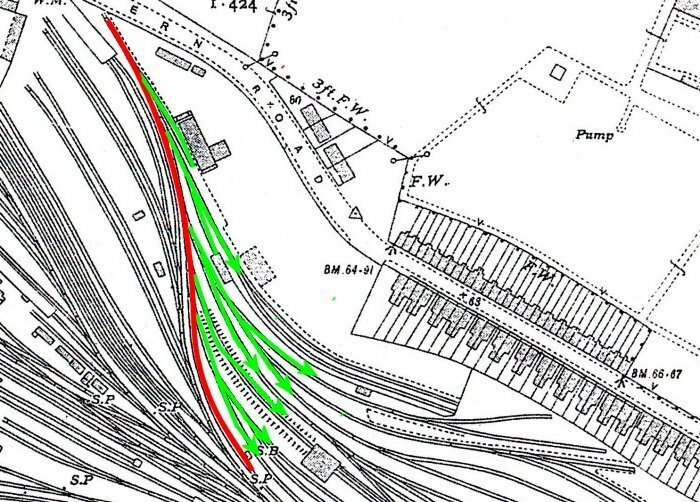 The trackplan is based on a real-world prototype, namely an interesting ladder of kick-back sidings in Gloucester Old Yard, which served a variety of purposes. By focussing on one end of the track ladder, the layout can feature a variety of stock movements in a limited space, while still following the prototype. The plan above illustrates the variety of stock and moves that can be justified on the layout. For 1-5, trains are drawn back/propelled into the headhunt (and hence onto the layout) before being moved into the relevant siding (ie back off-scene). Movements of the Loco Coal wagons were especially interesting: They were exchanged between the yard pilot and the shed pilot. 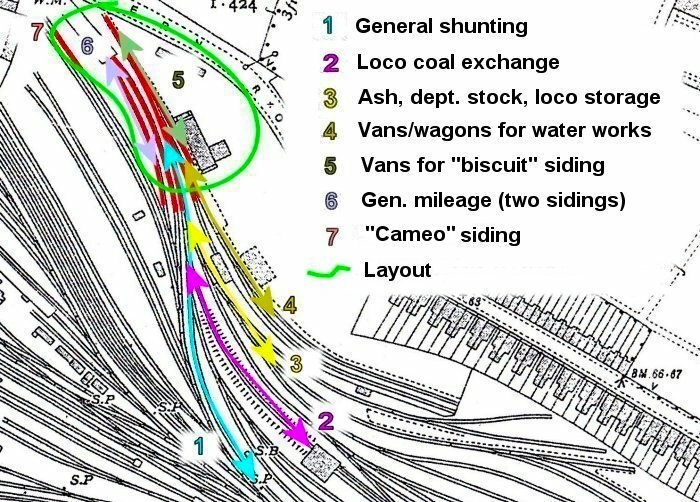 The two mileage sidings (6) provide for a bit of general shunting (edit: and coaching stock storage, see below). The small section of track (7) is a scenic indication of the rest of the mileage sidings. A very cunning plan Mikkel.I like the idea of it being set in 1947,so what locos and stock are you planning to use ? A clever and cunning idea! You could run it at almost any point in history, as I believe this still exists today. Good luck with it and I look forward to seeing more from you. What a research. Nicely choice for your Farthing Sidings. I the past I had also a look at the railways at Glouchester. Was interested in the railways around the docks. Thanks gents. It still exists? Amazing, I'll have to look into that. Might even be worth a trip if I get to go to the UK for work sometime this year. Yes, I reckon 1947 is just your cup of tea Rob! I love the pregrouping period but also have a thing for the more mundane and austere latter-day GWR. With these little layouts I can have both. Love the detailed research and well thought out proposal. 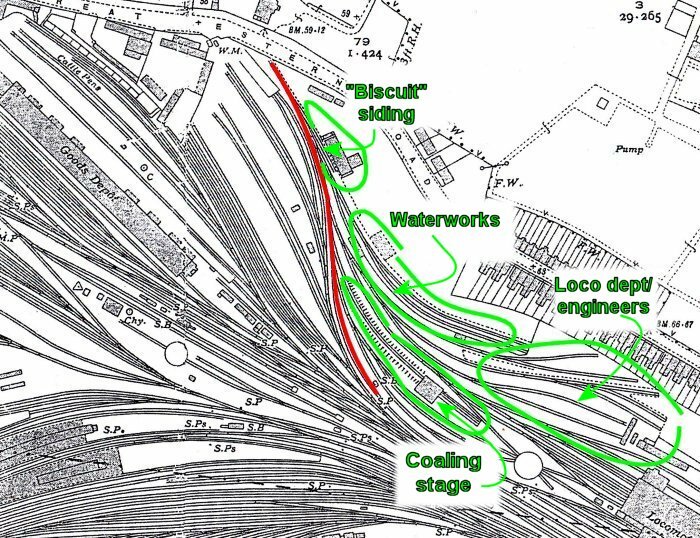 From the second plan, do you eventually intend to make the waterworks, loco dept and coaling stage as separate cameos too? There's a lot of scope here and the Farthings are turning into a detailed history project as much as anything else - I like the idea that the individual cameos come from different periods - perhaps you could even bring one of them right up to present day? You could even incorporate the old Gloucester docks into another. Anyway, I'd still love to see you do a broad and standard gauge mix layout sometime. At any rate, after all that hard research work I think you deserve a nice cup of tea and some Huntley and Palmers biscuits!!! Thanks for that link Job! Looks like there's some interesting info on goods and people of the area for inspiration. I can see why you were interested in the docks too, great setting for a layout. Maybe we can tempt you to do it after your "Urban Scene"? From the second plan, do you eventually intend to make the waterworks, loco dept and coaling stage as separate cameos too? Hi Mike, well I'm afraid my pace is rather slower than yours, so don't hold your breath :-) But the loco dept sidings would make a nice little layout in itself, I think. Regarding the waterworks sidings, I haven't found out what kind of stock served them - photos seen so far don't show it well. I should stress that my research has so far mostly consisted of reading the GWRJ articles and a few other sources. So as usual we stand on the shoulders of the giants who did all the hard work for us. Yes, the photo and setting is excellent. It's all there. Note also the guy in the window on the extreme left of the enlarged version. Regarding Gloucester I have added an image to the main entry above. The close-up views of that photo show some interesting coaching stock in the sidings - and some of it isn't even GWR I think. I've been looking forward to seeing where you were taking this ever since you first proposed it. I never knew Farthing was so big off stage - all these years I imagined it to be nice peaceful little hamlet (did you see what I did there?) but instead it's a walloping great market town saturated with steel rail. And what a photo you've posted there with the Sou'Western sheeted open to the right and that lovely Sou'Eastern open to the left, that well-stacked pile of coal and the Pooley weighbridge. What on earth is that sheeted thing behind the loading gauge - it looks like a house made of boxes or baskets! I suppose Farthing has grown a wee bit since I began ;-) And I admit the bay platform and very attendant station master might give the wrong impression! Let's just say it was like Newbury in 1907 - but had grown somewhat by 1947. Anyway, I wonder if the odd sheeted thing is a pile of boxes full of... biscuits? A brilliant idea and well executed planning too. The historical side to this proposal is both interesting as well as informative. Like others have said the maps and photos give a good idea of what you plan to achieve. Also the move away from pre-grouping to the 1947 period will certainly be interesting. I'm looking forwards to seeing the locomotives and rolling stock you model which I guess will appear in a work weary state. A total contrast to the glamour of the pre-grouping times. Hi Mikkel, interesting thought provoking stuff as usual! I'm really looking forward to seeing this develop. That's a fantastic quality photo you've linked to, packed full of detail and atmosphere. I've just spent a very happy 10 minutes soaking it all up, thanks for sharing! The weighbridge man had an important job. He would be keeping records (In-coming and outgoing) of every wagon / van over the Pooley deck. Details of wagon number, tare and net weights and date in and out. All these were needed to collate and check various charges from the rail companies and material suppliers. All done in a neat hand in large ledgers in those pre-computer days. In 1947, the chances are that the weighbridge mechanism would be a manual "steel-yard" type, none of your fancy direct read-out dials!! If you're taking inspiration from that amazing Huntley & Palmers' shot, Mikkel, I think you ought to be sticking to c 1908... (I doubt the trackwork would have looked like that post WWII !). Btw, I suspect the pile of boxes are empties. Superb research Mikkel; another wonderful prologue to what I'm sure will be another superb feast of modelling excellence. I also have to admit that your plan has got me thinking that there's so much more to micro layouts that once could easily imagine... and the planning and thoughts that go into all of this are giving me pause to reconsider plans myself... why aim fos something small when you could go fo just a small part of something bigger. A total contrast to the glamour of the pre-grouping times. Mark, yes, I already feel a bit out of my pre-grouping comfort zone :-) Amazing how quickly we get locked in on particular periods. Fortunately there are lots of 1940s afficionados to help, including on here. That's a fantastic quality photo you've linked to, packed full of detail and atmosphere. The weighbridge man had an important job. Yes, I've always liked weighbridge buildings. In Gloucester I imagine there would have been one by the private goods depot alongside the "biscuit siding". Can't spot one in the photos though, but that part of the yard was not well photographed. Ah yes, those boxes in the photo might well be empties. I wonder what would have happened if there was a storm! ... and the planning and thoughts that go into all of this are giving me pause to reconsider plans myself... why aim fos something small when you could go fo just a small part of something bigger. What a fascinating photo! A traverser, narrow gauge wheelbarrows, and some very unusual GWR wagons - note the inside-sprung W-irons and that wooden ended form of tilt wagon. And just look at the sharp curve in the up and down wheelbarrow main line on the far right.You'll need some of these in the Depot as well. That really is good stuff. It's all crying out to be modelled. 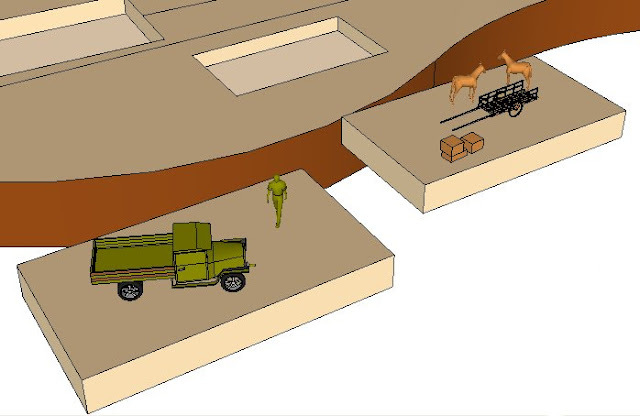 Also a bit overwhelming, that place has the potential for 2-3 layouts in itself! A wheelbarrow main line? Surely not? It seems that the fiddle yard will need to be very very(?) large for all the different stock you will be running back and forth on that one headshunt? That's a very good point Rich. It would be ridiculous to have a huge fiddle yard for a micro. I was thinking of having a separate cassette for each train (less the loco). I like hassle-free operation, but as the stock would not all be shunted at the same time of day, there would be different sessions, each with a couple of cassettes. Could that not work? I should perhaps stay that the next step in the planning will be to "translate" the Gloucester setting into the one at Farthing. This includes scaling down the volume of things a bit. I must say, that I find researching a subject almost as compelling as building the actual model...always new things to discover and emerge. Hi Pete, I agree, the research for a layout is a big part of the fun. The only problem is that new layout options keep popping up the more you explore!